Master-Bilt MBGFP27-HG Bottom Mounted Swing Glass Door Freezer Merchandiser With Lighted Sign, 25 Cu. Ft. 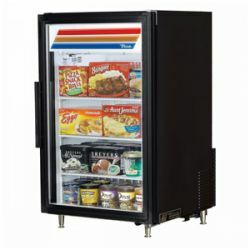 True GDM-10F-HC~TSL01 Black Glass Door Merchandiser Freezer with LED Lighting - 10 Cu. Ft. 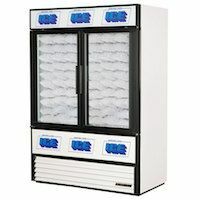 True GDM-10F-HC~TSL01 White Glass Door Merchandiser Freezer with LED Lighting - 10 Cu. Ft. Merchandising Freezers designed to encourage customers to make a quick purchase of your frozen products. Glass doors allow you to present your frozen treats and other products in the best light. 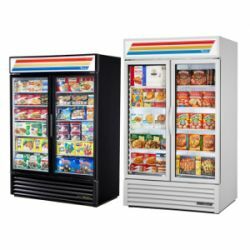 Merchandising freezers do exactly that by marketing your goods and many models include bright lighting and back-lit customizable signage for drawing the attention of your customers. Some models are smaller and fit near points of sale, occupying minimal floor or counter space. Merchandising Freezers include upright, floor models and smaller countertop units. These freezers are designed to encourage customers to make a quick purchase. Glass doors allow you to present your frozen treats, such as ice cream novelty bars, pints of gelato and other products, in the best light. Ideal for convenience stores, grocery stores, ice cream shops, and more. One-, two-, and three-section glass door merchandisers are available, and many models include bright lighting for optimal presentation of your frozen goods. Back-lit signage is designed to draw the attention of your customers. Some merchandising freezer units are designed to sit on available counter space near points of sale, taking up very little space but offering so much. Even ice merchandisers, with their glass doors, present the product in an appealing manner.